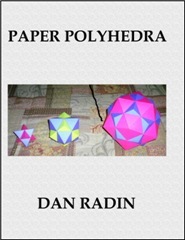 The links below contain Adobe PDF files of basic shapes that can be cut out and put together to make all kinds of polyhedra. For best results, print the patterns on colored card stock. Make sure that scaling is turned off when you print the patterns. Use a sharp point (such as a compass tip) and a straight edge to score along the dotted lines. Cut along solid lines (for tetrahedron, cut along light gray lines too). Then fold along the dotted lines. The folded tabs can be attached together with glue, glue stick, a stapler, or double-sided clear tape (if you use double-sided clear tape, apply tape before cutting out shapes). The tabs can be folded to the outsides of the shapes or they can be concealed on the inside. Use the stellation patterns to create points on the faces of platonic solids. Use the small arrow heads to align the stellations. Have fun!!! version of all of these patterns.